Established in 1997, Salalah Medical Supplies Manufacturing Co. LLC is a shareholding company 100% owned by Omani nationals and managed by a team of professionals. SMSMCO is producing a wide range of medical devices and disposables such as latex gloves, surgical facemasks, bandages, adhesive plasters, surgical absorbents, etc. to private and public sectors across the Sultanate, the neighboring Gulf countries and other parts of the world under the brand MEDIK. The company has grown to be the prime supplier for the public sector in Oman and neighboring countries in the Gulf. Strategically located at the Raysut Industrial Estate, in an area of 18,000 sq. meters of land occupied by facilities for administration, production, quality control (laboratories), storage and workshop, Salalah Medical Supplies Manufacturing Co. LLC is just 5 kms away from Port Salalah which ensures convenient and quick handling of products for export. Equipped with state-of-the-art machinery for production and testing and manned by qualified and experienced personnel, SMSMCO’s commitment to quality not only reflects into the production but also into all aspects of business operation. Organizationally, we are structured to undertake the challenging task with the objective of supplying our customers with the highest quality products and provide outstanding levels of sales and delivery service, thereby increasing our market share. Staffs involved in the production and quality control of our products are highly qualified and experienced, forming the core of our business. Their continued training to meet product innovation requirements is mandatory. Salalah Medical Supplies Mfg. Co. LLC responds to its client’s needs by delivering only the highest quality medical devices and disposables for its most quality conscious clientele. Salalah Medical Supplies Mfg. Co. LLC developed and implemented a QMS (Quality Management System) to demonstrate its ability to consistently provide medical devices and disposables that meet customer and regulatory requirements, and to address customer satisfaction through effective application of the system, including continual improvement and the prevention of non-conformity. 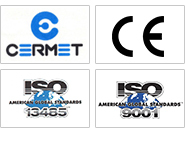 The QMS complies with ISO 9001:2008; ISO 13485:2003 and 21 CFR 820 of the US FDA.